I'm not usually one to decorate for the seasons, but when I saw this idea of a mini indoor garden on The Inspired Room, I knew I had to give it a try in my own way. It is a quick and easy way to add a touch of spring to your home and you don't even need to be crafty. I used some fresh herbs, a few flowers and a greenery plant, but the possibilities are endless of what type of plants you could use. Step 1: Find a container with a stand that you can use for your indoor garden. This can be as simple as finding something already put together like I did, or you could make a box and attach it to the top of an old end table that you find in a thrift store. Mine is made from a beverage holder bucket I found at Target for $14.99 and the matching stand for $12.99. Step 2: Fill with potting soil and plants of your choosing. You want to choose plants and flowers that will stay small, grow low and are easy to cut back. I chose to use lavender and thyme so that I could actually use them when I cut them back. It's that simple. 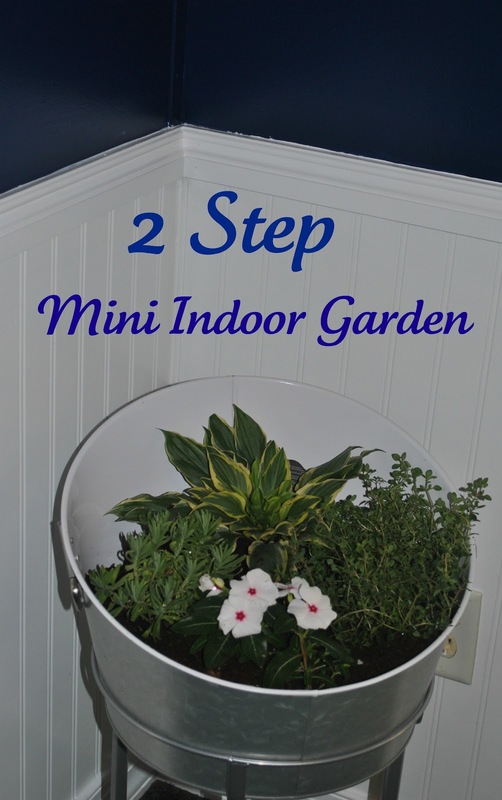 Two easy steps to a beautiful indoor garden that adds the perfect Spring and Summer decor to your home. Very nice! I love that. You did a great job! I would love to try this! What a wonderful idea, especially if you live somewhere where maintaining a garden is difficult. Nice! I just started growing herbs in tiny pots but if those don't die immediately I plan on branching out to flowers. Thanks for the easy steps! I wanted to get basil, but my vote was vetoed LOL. This is a great idea for an indoor herb garden. Great idea! I should try that for my herbs! I love this idea, looks good! My mother does some great containers with different plants. I try to do them, but don't have as much luck as she does. That's really nice. I love the style container you chose. If I was voting, I would have gone with you and picked basil, it's my favorite. I have two basil plants in my house... I even used some last night with dinner. Can't wait to see what else you plant in there.